Hi kids, your captain, Tim Turbo is back in the cockpit. No long talking today, because I got no important news for you, except for “It’s spring!!!”. And the mix is finest electro ghetto bass style as always. Sit back, fasten your subwoofer or headphones and enjoy. While getting your weekly dose of bass maybe check out these valuable and instructive thingys: my Facebook group, where you also have the chance to subscribe to the podcast feed via RSS or alternatively subscribe via iTunes. Also hit the subscribtion form for our newsletter or show me some written love (haikus, anyone?) on timturbo[at]seen-site[dot]com. Book me by writing some real talk to: book.tim.turbo[at]seen-site[dot]com. Take care! The message is love! P.S. 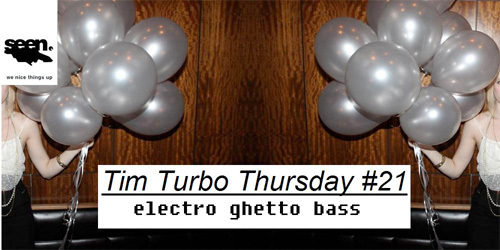 : Today´s Tim Turbo Thursday is dedicated to Germany’s thirty-seventh best rapper Ron Foto. Many people do not respect him because they don’t have time for it. A legitimate reason?